If you want to position iPhone for a photo and then not touch it, or if you can’t see the iPhone display to frame a shot, you can use Apple Watch to view the iPhone camera image and tap the shutter. To function as a camera remote, Apple Watch needs to be within normal Bluetooth range of iPhone (about 33 feet or 10 meters). Take a photo. Open the Camera app , then position iPhone to frame the shot using Apple Watch as your viewfinder. 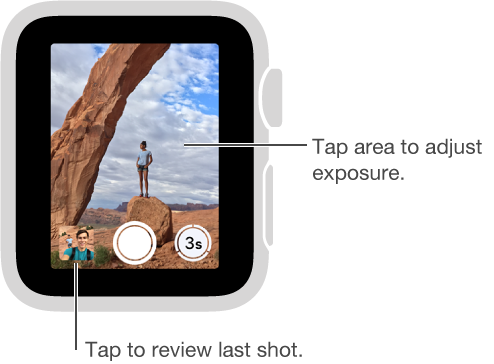 To adjust exposure, tap the key area of the shot in the preview on Apple Watch. To take the shot, tap the Shutter button. The photo is captured in Photos on your iPhone, but you can review it on Apple Watch. Review your shots. Tap the thumbnail in the lower left. Swipe right or left to see other shots. While viewing a shot, turn the Digital Crown to zoom. To pan, drag with your finger. Tap anywhere to hide or show the Close button and the shot count. Double-tap to fill the screen or see the whole shot. When you’re finished, tap Close.